Jesse Russell Orosco (born April 21, 1957) is a former relief pitcher in Major League Baseball who holds the major league record for career pitching appearances, having pitched in 1,252 games. He pitched most notably for the New York Mets in the 1980s. He won a World Series in 1986 with the Mets and in 1988 with the Dodgers. He threw left-handed, but batted right-handed. He retired in 2003 after having been with the Mets, Dodgers, Cleveland Indians, Milwaukee Brewers, Baltimore Orioles, St. Louis Cardinals, San Diego Padres, New York Yankees, and Minnesota Twins. He retired when he was 46 years old, one of the oldest players to still be playing in the modern age. Orosco is one of only 29 players in baseball history to date to have appeared in Major League games in four decades. Orosco's longevity was greatly aided by the increasing use of left-handed specialist relief pitchers from the 1990s onward; in his last several years, he was used almost exclusively in this role. 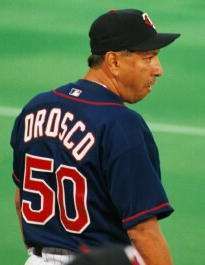 Orosco was drafted by the Minnesota Twins in the 1978 Major League Baseball Draft. In February 1979, the Twins traded Orosco to the New York Mets to complete a deal that had been made two months earlier. In December 1978 the Mets traded veteran starter Jerry Koosman to the Twins for two players, one of whom was a player to be named later. The trade of that player, Orosco, completed the deal. Orosco made his debut on April 5, 1979 with the Mets. He played his last game on September 27, 2003 with the Twins. Orosco had his best seasons in the early and mid-1980s with the Mets. He had a career-best 1.47 ERA in 1983. That year, he also won 13 games and saved 17, with 110 innings pitched, making his first All-Star Team and finishing third in the National League Cy Young Award voting. He had 31 saves in 1984, which was 3rd in the National League, and went 10–6 in 60 appearances; good enough for his second All-Star selection. In 1985, he began sharing closing duties for the Mets with right-hander Roger McDowell, giving the Mets a vaunted lefty–righty combo coming out of the bullpen to close games. In 1983, Orosco became just the third and, to date, the last Mets pitcher to record two wins in the same day. This feat had been accomplished by Craig Anderson in 1962 and Willard Hunter in 1964. On July 31, 1983, Banner Day, the Mets won both games of a double-header against the Pirates in extra-inning walk-off wins. Orosco pitched the last four innings of the first game and the final inning of the second game, and both times was the pitcher of record when the Mets rallied to win. Orosco's clutch relief pitching in the 1986 postseason was one of the key reasons the Mets were world champions. He was on the mound for the final pitch of the final game of both the NLCS against the Houston Astros, and the World Series against the Boston Red Sox. Orosco ended both series by striking out the final batter. Orosco also provided one of the most memorable images of that World Series and it would become an iconic image to the Mets and their fans: after striking out Marty Barrett to end the series, he threw his glove way up in the air and immediately dropped to his knees while catcher Gary Carter ran out to the mound to embrace him. The photo was taken by Mets photographer George Kalinsky, who's also the photographer at Madison Square Garden. For many years, this was the final scene shown during the ending credits of the syndicated Major League Baseball news show This Week in Baseball. Having also become the first (and only) relief pitcher to get three wins in one playoff series (which he accomplished in the NLCS against the Astros), Orosco would primarily be remembered for that year. Coincidentally, Jerry Koosman, whom the Mets had traded to Minnesota in the deal that brought Orosco to New York, was on the mound for the final out of the 1969 World Series—to date, the only other Fall Classic the Mets have won. The final batter in that World Series, Davey Johnson, would be Orosco's manager on the '86 World Championship team. After getting traded away by the Mets in a huge deal involving over seven players, he found a very brief one-year home with the Dodgers, and then signed with Cleveland and stayed there for three years. His only real recognizable home besides the Mets came in Baltimore when he stayed with the Orioles for the latter half of the 1990s. While his best seasons came in New York, he had an excellent 1997 season, finishing with a 2.32 ERA, his best since the 1980s. On June 25, 1999, Orosco set the all-time record for major league relief appearance with 1,051 passing Kent Tekulve. His playing career was still not finished though. In 2003, he was on three different teams and finished with 33 innings pitched. The 2003 season also marked his return to New York, this time though with the Yankees. He was traded to the Yankees from the San Diego Padres for a player to be named later. He signed with the Arizona Diamondbacks for the 2004 season but decided to retire before spring training and finish a historic career. He was eligible for the Baseball Hall of Fame in 2009; however, his lifetime stats made him a longshot for the Hall. He was the last active MLB player from the 1970s, outlasting Rickey Henderson (the last active position player) by over a week. While Henderson got inducted on the first ballot, Orosco was off future Baseball Writers Association of America ballots after only receiving one vote. He finished his career with an ERA of 3.16, and is the all-time record holder for games (by a pitcher), with 1252. He has 74 more than Mike Stanton who is second with 1178. Made the NL All-Star team in 1983 and 1984. Went 3-1 in postseason play in 24 games all-time. Pitched 5 scoreless innings in the 1986 World Series, and had an RBI single in his only career postseason at-bat in the deciding Game 7. Led the league in Games in 1995 (65). Committed only 4 errors in 1,295 career innings pitched over 24 MLB seasons for a .985 fielding percentage. Ranks #1 in Games Pitched on the All-time leaderboard All-time G leaderboard from Baseball-Reference.com. Ranks #17 in Strikeouts/9 Innings Pitched on the All-time leaderboard with 8.194/9 ip All-time K/9 ip leaderboard from Baseball-Reference.com. Ranks #23 in Hits Allowed/9 Innings Pitched All-time with 7.332 Hits/9 ip All-time H/9 ip leaderboard from Baseball-Reference.com. Ranks #82 (tie) in Saves on the All-time leaderboard All-time S leaderboard from Baseball-Reference.com. The last player who played in the 1970s to play a major league game, 8 days after Rickey Henderson's final game. The last player from the 1986 Mets championship team to play a major league game. Pitched the last pitch of the 1986 NLCS against the Astros and the 1986 World Series against the Red Sox. He struck out the opposing hitters with both pitches. ↑ “Career Leaders for Games Pitched” (http://www.baseball-almanac.com/pitching/pigamp1.shtml). Baseball Almanac. Retrieved 2015-06-26. ↑ Strauss, Joe (August 6, 1999). “Armed for history” (http://articles.baltimoresun.com/1999-08-06/sports/9908060025_1_orosco-kent-tekulve-games-pitched/2). BaltimoreSun.com. Retrieved 2015-06-26. ↑ Corio, Ray (23 July 2003). "At Age 46, Orosco Is Joining The Yanks". The New York Times. Retrieved 30 May 2010.